On-site registration begins at 8:00am. Pre-registration open until April 20th. There are still volunteer opportunities available, please consider lending us a hand! We are looking forward to a fantastic 2013! Thank you!! Through the chili cook-off, Scentsy fundraiser and toy/food drive River’s Rally raised $250 to make purchases for Operation Christmas. We also donated 5 bags of non-perishable food items to the Serenity House in Balsam Lake. Thank you to all that participated and donated. With your help, we are making a difference. Wishing all of our supporters a very Merry Christmas and Happy New Year’s! 1st Place: Jake Foerst, Paula Foerst & Zachery & Loretta Tourville. You got it, that’s a three-way tie! Paul Bainbridge – for the 3rd year in a row! Thank you to all that came and made donations! We have three bags full of food pantry items and we raised enough money to make our usual donation to Operation Christmas. THANK YOU!!!! Bring a toy or non-perishable food item to the Milltown Community Center on November 24th between 5:00 and 7:00 to be donated to local charities. We have an online Scentsy fundraiser going on through the Chili Cook-off. You can order online here by choosing the “Chili Cook-off” in the Open Party list. Thank you, Amanda Kuske for your time and generosity to River’s Rally! She will be at the event also so you can purchase on site. Order your holiday gifts and help River’s Rally at the same time! 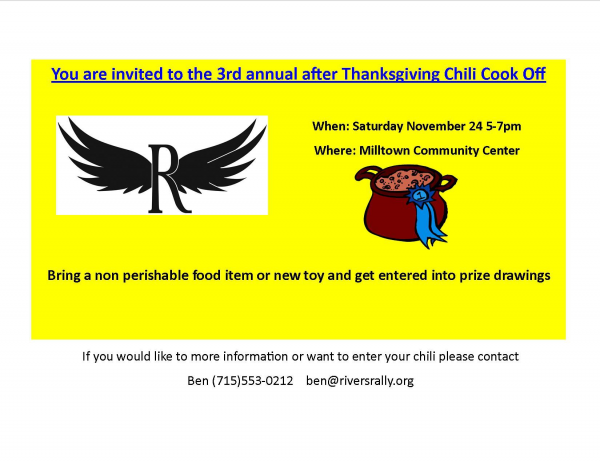 Please print the invitation above to attend the chili cook-off as we will be collecting them at the door. We are happy to announce that the 3rd Annual River’s Run & Ride Rally raised over $8500! We have given to many causes already this year with many more to come. We are working on a project with Faith’s Lodge to manufacture permanent plaques for the 120 trees that have been planted since the storm in July 2011. We have volunteered and brought food at Faith’s Lodge this summer. It is looking wonderful! The Compassionate Friends chapters will receive a total of $2500 from River’s Rally. River’s Uplift program has given $400 to local benefits, $200 to the Milltown Public Library for summer reading program and $200 for the upcoming Kid’s Night Out. Take advantage of this event if you are in the area. Next Tuesday, August 28th the Milltown Police Department and Village of Milltown have a fantastic party just for the kids! Fun begins at 5:00PM at the Milltown Community Center. We are looking forward to fall events and gearing up plans for next year. We want to thank everyone that responded to our survey, your feedback is much appreciated. Also a heads up for those that participated in the 10K, the gravel road is now paved! This was a wonderful sight! Thank you to everyone that has helped River’s Rally be a great success! We are amazed and honored to have so much support that as of today River’s Rally has raised almost $10,000! THANK YOU so much to everyone that came, donated, volunteered or participated in any way to make today such a huge success. We will update soon with race results and other notes about the wonderful celebration we had today. Check back! There are no words to express our gratitude for the support shown last night at our Rocket Club event! It was a great turnout and an AMAZING show! We will post pictures as soon as we have them (which there are A LOT, thanks to Kix Photo)! A big thank you to our volunteers, photographer, guests, Cricket’s Bar & Grill and Rocket Club for a very memorable event in honor of River. If you have not checked out Rocket Club yet, you MUST! They are an amazing group of guys with the biggest hearts and they put on a great show! Their latest album (which is awesome, by the way) is available to download at iTunes or you can buy it on their website. If you have not been to Cricket’s Bar & Grill lately, you should check it out. Their hand-tossed pizza was delicious, and the band thought their burgers were the best! Thank you Gary and staff for a great night! Rocket Club will be here tomorrow! There are still limited tickets available here. There will be minimal tickets available at the door. Don’t wait any longer to get tickets if you still want to attend this event! 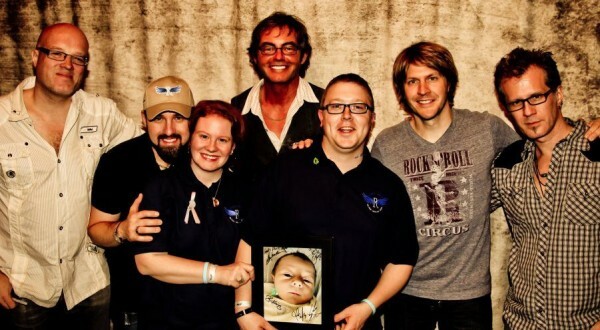 We are very much looking forward to this event and celebrating River’s life with an amazingly wonderful band! Did we mention that you get to meet them?